UKTV Play offers online streaming of some great TV programmes from channels such as Dave, Really, Yesterday and Drama. Ever since Freeview entered the market viewers in the UK have been spoilt for choice and for those of you who remember having just 3 or 4 channels then it is a welcome addition. If you’re in the UK it’s possible to access UKTV Play online and watch shows from four great channels at a time convenient to yourself. However, if you’re outside the UK it is a little bit more complicated because you can’t directly visit the website and watch otherwise you’re hit with a block message like the one below. The video you are trying to watch cannot be viewed from your current country or location. So if you’re on holiday, travelling or just live outside the UK then it can be pretty frustrating. Lucky for you though there is a really easy way to watch with a simple workaround that we’ll explain in this guide. If you live outside the UK or are just abroad then your internet connection allows websites to determine your location. When you visit the UKTV Play website it checks your internet connection for your location and if it discovers you’re not in the United Kingdom then it stops you from watching. There is nothing you can do yourself to stop this and to mask your connection location requires an app called a VPN. A Virtual Private Network (VPN) is a system that encrypts your internet connection to protect your privacy. One of the privacy features is it can disguise your location and allows you to give the impression that you’re in a different country. For the purpose of watching UKTV Play you would want to disguise your location and pretend you’re in the UK. It doesn’t matter where you are in the world and the VPN service takes care of all the technical aspects. All you need to do is hit connect. Keep reading and we’ll show you just how simple this is. Firstly you’re going to need a VPN service. There are thousands of options out there from a huge variety of companies from small to large. A typical VPN service is going to cost roughly £3 – £6 per month (US$5-$9) but can be cheaper if you opt for a package length longer than one month. Luckily there are some very good VPN providers out there who offer fast speeds which is essential when viewing video such as streaming from UKTV Play. Unfortunately, there are some poor providers too and weeding out the good from the bad is an almost impossible task solely from their advertising jargon and flashy websites. We test VPN services on a regular basis and the VPN provider we would recommend is IPVanish due to the quality and speed of their service. If you’re like us then there are a handful of TV shows on Dave that you like watching. We actually made use of the service to watch 24 Hours to go Broke while on holiday. Of course none of us go away to watch British TV but there are often 30 minute down periods for everyone, you can’t be taking part in activities all the time so in a rare lull in activity it’s nice to have access to UKTV Play. 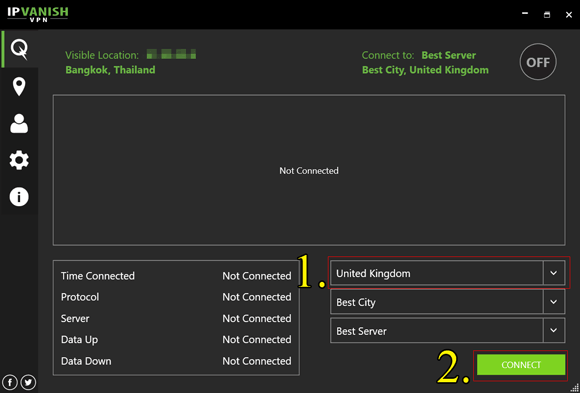 First you need to sign up to a VPN provider, one of our three recommended ones above would be a good starting place. Next download the provided software or app for your PC, Mac, Android or iOS device. When you’ve downloaded this you then need to make connection to a server based in the United Kingdom. This is pretty self-explanatory with most software but with IPVanish you can find this by selecting United Kingdom (1.) and then press Connect (2.). The software itself takes care of the connection and within 30 seconds or less you’ll be connected and as far as any websites are concerned from now on you’re in the UK. All that is left to do is head over to the UKTV Play website and find the programmes you want to watch. Now rather than being hit by a message telling you that you’re not in the correct country or location it’ll stream you the programme. After you’ve watched the programme you want just disconnect on the VPN software, it’s as simple as that. 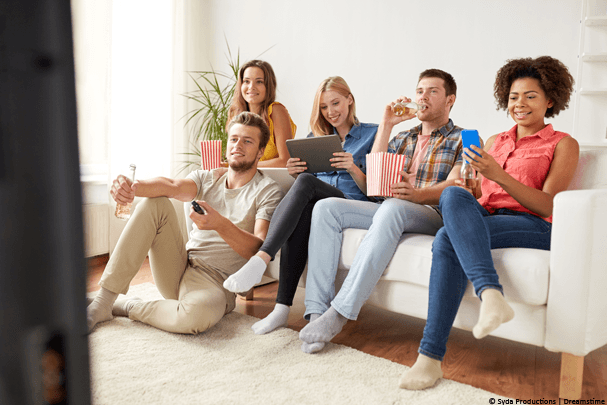 You can reconnect whenever and as often as you like and also use your VPN service to enjoy iPlayer, Sky Go, 4OD and the whole range of UK online catch-up TV services. Why not take a look around our site to see what else you can put your new VPN service to use on?